Introduction: The Pap stained cervical smear is a screening tool for cervical cancer. Commercial systems are used for automated screening of liquid based cervical smears. However, there is no image analysis software used for conventional cervical smears. The aim of this study was to develop and test the diagnostic accuracy of a software for analysis of conventional smears. Materials and Methods: The software was developed using Python programming language and open source libraries. It was standardized with images from Bethesda Interobserver Reproducibility Project. 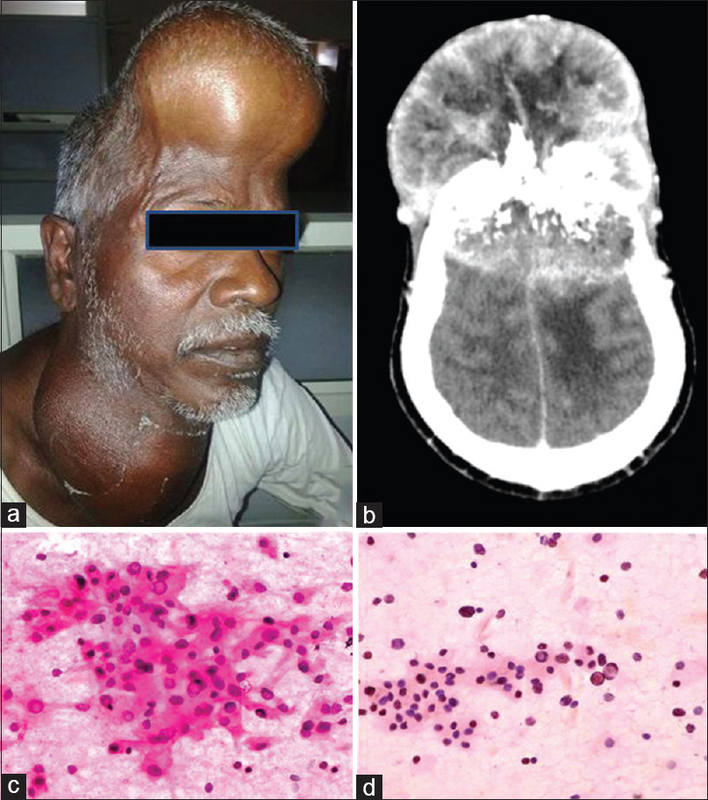 One hundred and thirty images from smears which were reported Negative for Intraepithelial Lesion or Malignancy (NILM), and 45 images where some abnormality has been reported, were collected from the archives of the hospital. The software was then tested on the images. Results: The software was able to segregate images based on overall nuclear: cytoplasmic ratio, coefficient of variation (CV) in nuclear size, nuclear membrane irregularity, and clustering. 68.88% of abnormal images were flagged by the software, as well as 19.23% of NILM images. The major difficulties faced were segmentation of overlapping cell clusters and separation of neutrophils. Conclusion: The software shows potential as a screening tool for conventional cervical smears; however, further refinement in technique is required. Objective: To distinguish fibrolamellar hepatocellular carcinoma (FL-HCC) variant from the conventional hepatocellular carcinoma (HCC) by cytology, immunocytochemistry, and morphometry. Study Design: Retrospective detailed cytomorphological, immunocytochemical, and morphometric analysis was performed in 6 cases of FL-HCC reported on fine needle aspiration. 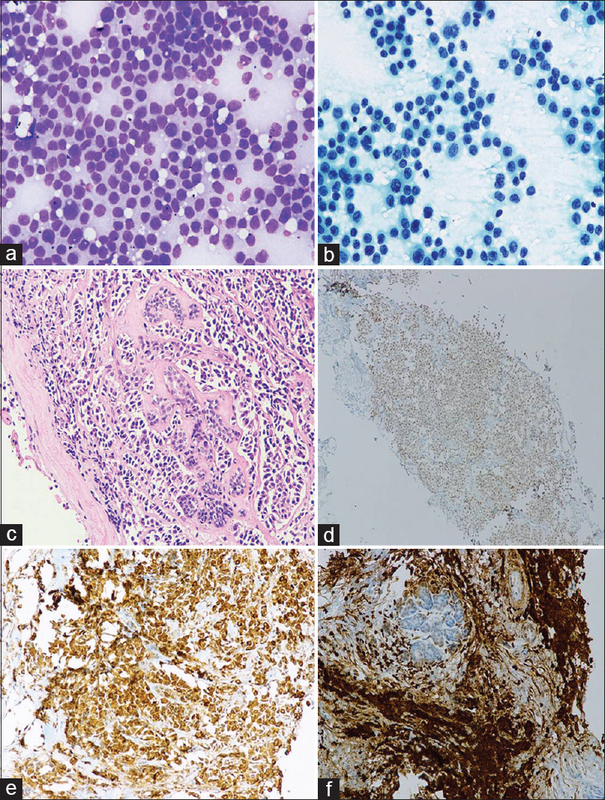 Cell block immunocytochemistry (CB-ICC) for CK7 and CD68 was performed in four cases. Morphometry was carried out with Cell A software. Area of the cell, nucleus and nucleolus was measured in 50 nuclei per case in 6 cases each of FL-HCC and HCC. Results: The mean age of patients with FL-HCC was 19 years and all had normal serum alpha-fetoprotein levels. Fine needle aspiration smears showed large polygonal cells with abundant cytoplasm, vesicular nucleus and prominent nucleolus, associated with variably cellular fibrous stromal fragments. 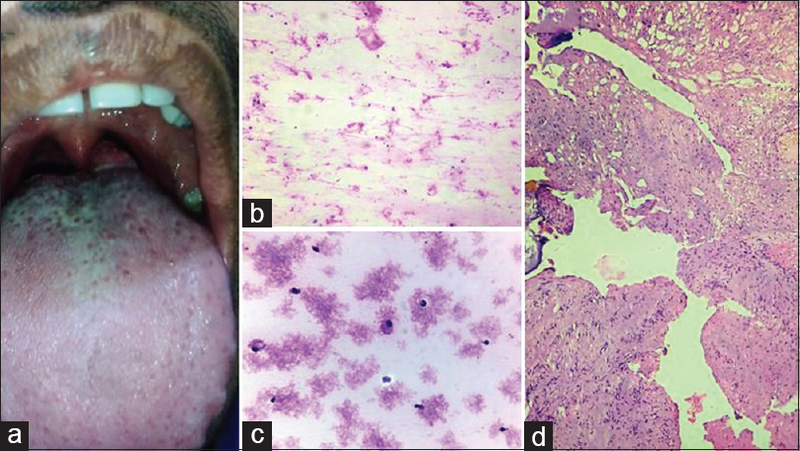 Intranuclear inclusions, cytoplasmic eosinophilic inclusions, and bile were also noted. FL-HCC showed strong membrano-cytoplasmic CK7 positivity and cytoplasmic granular and canalicular positivity for CD68. In contrast, HCC showed weak focal positivity for CK7 and only canalicular CD68 positivity. Morphometry revealed that FL-HCC cells were 2.19 times the size of HCC. Conclusion: CK7 immunocytochemistry on cell blocks is useful for confirming and distinguishing it from HCC. Background: Cytologic examination of body fluids commonly involves the use of direct or sediment smears, cytocentrifuge preparations, membrane filter preparations, or cell block sections. Cytospin and cell block techniques are extremely useful in improving cell yield of thin serous effusions and urine samples, and ensure high diagnostic efficacy. Materials and Methods: We studied cytospin preparations and cell block sections prepared from 180 samples of body fluids and urine samples to compare the relative efficiency of cell retrieval, preservation of cell morphology, ease of application of special stains, and diagnostic efficacy. Samples were collected and processed to prepare cytospin smears and cell block sections. Results: We observed that overall, cell yield and preservation of individual cell morphology were better in cytospin preparations as compared to cell blocks, while preservation of architectural pattern was better in cell block sections. The number of suspicious cases also decreased on cell block sections, with increased detection of malignancy. It was difficult to prepare cell blocks from urine samples due to low cellularity. Conclusions: Cytospin technology is a quick, efficient, and cost-effective method of increasing cell yield in hypocellular samples, with better preservation of cell morphology. Cell blocks are better prepared from high cellularity fluids; however, tissue architecture is better studied, with improved rate of diagnosis and decrease in ambiguous results. Numerous sections can be prepared from a small amount of material. Special stains and immunochemical stains can be easily applied to cell blocks. It also provides a source of archival material. Objective: Endoscopic ultrasound-guided fine-needle aspiration cytology (EUS-FNAC) is a precise and safe technique that provides both radiological and pathological diagnosis with a better diagnostic yield and minimal adverse events. EUS-FNAC led to the remarkable increase in the detection rate of incidentaloma found during radiologic staging or follow-up in various malignancy or unrelated conditions. Aims: We did this preliminary study with an aim to evaluate the role of EUS-FNA in diagnosing and classifying adrenal lesions, clinical impact, and compare the outcome with the previously published literature. 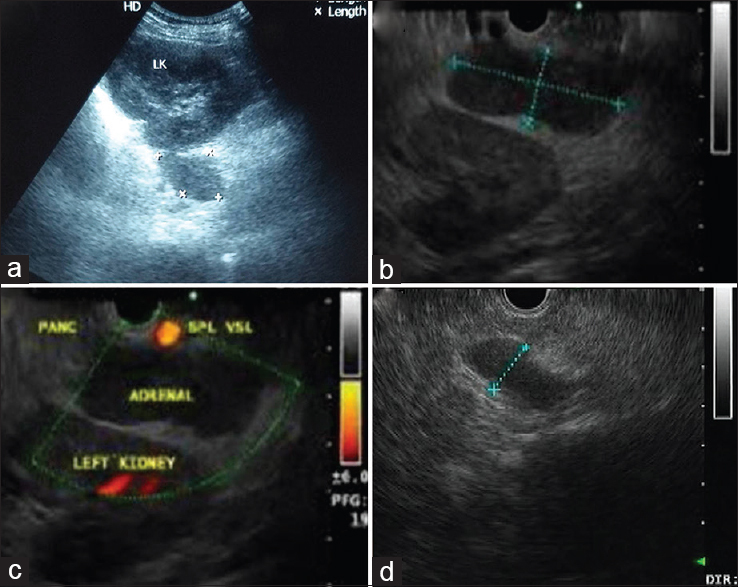 Materials and Methods: We included 32 consecutive cases (both retrospective and prospective) of EUS-guided adrenal aspirate performed over a period of 3.3 years. The indications for the aspirate in decreasing order were metastasis (most common carcinoma gall bladder) > primary adrenal mass > disseminated tuberculosis > pyrexia of unknown origin. 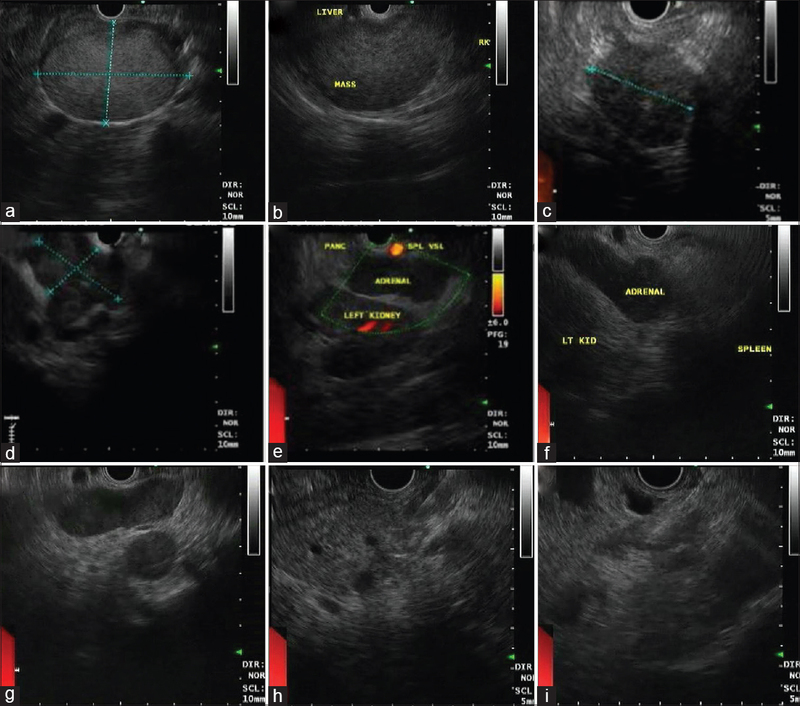 On EUS, 28 cases revealed space occupying lesion or mass (two cases bilateral) and four cases revealed diffuse enlargement (two cases bilateral) with a mean size of 21 mm. Results: The cytology reports were benign adrenal aspirate (43.8%), metastatic adenocarcinoma (15.6%), histoplasmosis (9.4%), tuberculosis (9.4%), round cell tumor (6.2%), adrenocortical carcinoma (3.1%), and descriptive (3.1%). Three cases (9.4%) yielded inadequate sample. The TNM staging was altered in 22.23% of the cases by result of adrenal aspirate. 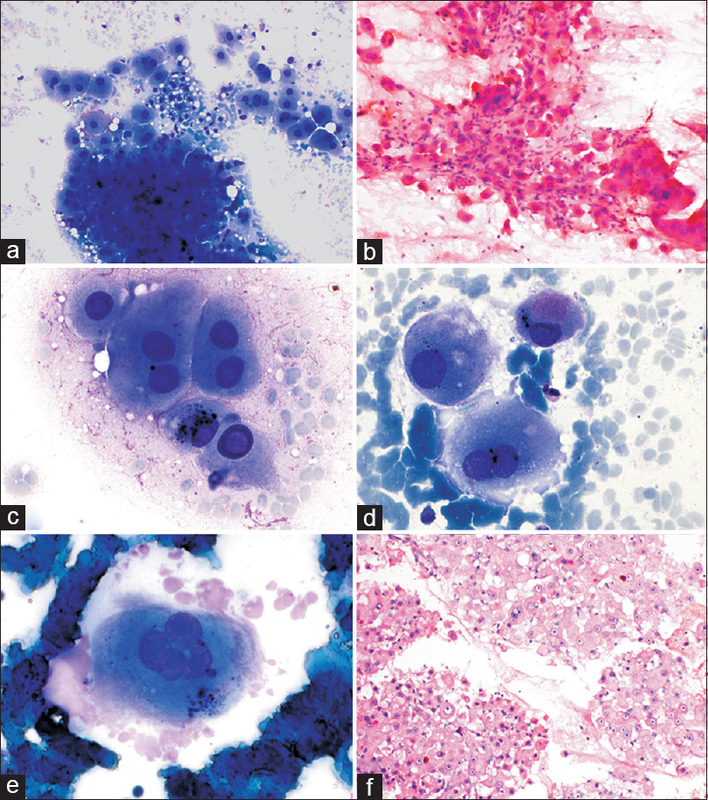 Conclusions: EUS-FNA of the adrenal gland is a safe, quick, and sensitive and real-time diagnostic technique, which requires an integrated approach of clinician, endoscopist, and cytopathologist for high precision in diagnosis. Although the role of EUS-FNA for right adrenal is not much described, we found adequate sample yield in all the four patients that underwent the procedure. Aims: The utility of GATA3 immunohistochemistry (IHC) as an aid to the cytological diagnosis of metastatic breast carcinoma in fine needle aspiration (FNA) specimens was investigated. 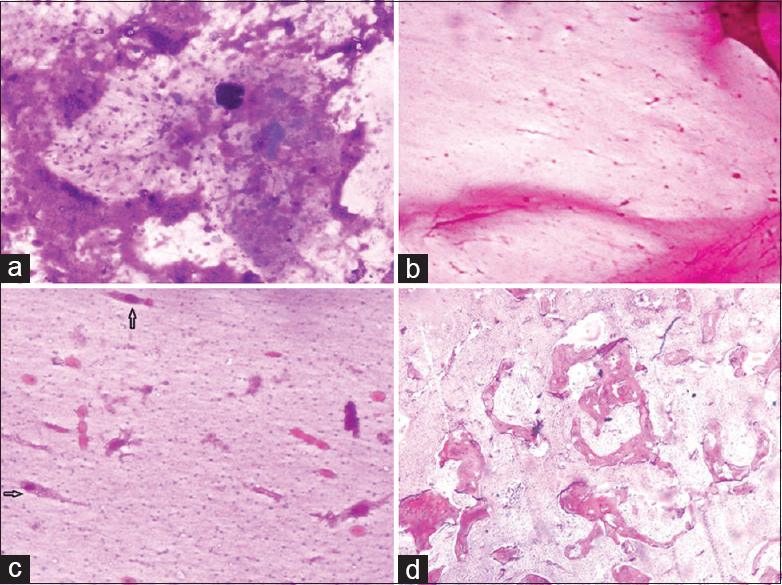 Materials and Methods: Cell block sections from 111 FNA cases of metastatic malignancy were stained for GATA3, including metastases from 43 breast and 44 nonmammary adenocarcinomas, 19 melanomas, 4 urothelial carcinomas, and 1 thyroid medullary carcinoma. Sites sampled included lymph nodes (87), bone (8), liver (5), lung (6), superficial masses (4), and pelvic mass (1). Results: Ninety-one percent (39/43) of metastatic breast carcinoma cases were positive for GATA3. All estrogen receptor (ER)-positive were also GATA3 positive cases. The majority (9/14; 64%) of ER-negative and 37% (3/8) of triple-negative cases were positive for GATA3. All nonmammary adenocarcinoma cases were negative with the exception of one case of metastatic pancreatic adenocarcinoma. Metastatic melanoma cases were all negative but 75% (3/4) urothelial carcinomas expressed GATA3. Conclusions: GATA3 IHC staining is a useful addition to IHC panels for FNA samples in specific settings such as distinguishing metastatic breast from lung carcinoma or melanoma. Introduction: Liquid-based cytology (LBC), initially developed for screening gynecologic specimens, is now being used in nongynecologic aspiration and exfoliative specimens. In this study, the diagnostic yield and utility of thin-prep (TP) was compared with conventional preparations to ascertain its utility in improving the diagnosis of respiratory lesions. Materials and Methods: Bronchial washings (BW) and transbronchial needle aspirates (TBNA) (bronchoscopy/endobronchial ultrasound-guided) from 70 consecutive patients of mediastinal masses and endo/peribronchial growths were included. The diagnostic yields of both conventional smears and thin-prep were compared. Immunocytochemistry (ICC) was performed on direct/cytospin smears of TBNA/BW and TP slides when the tumor could not be subtyped by morphology. Histopathologic correlation was done. 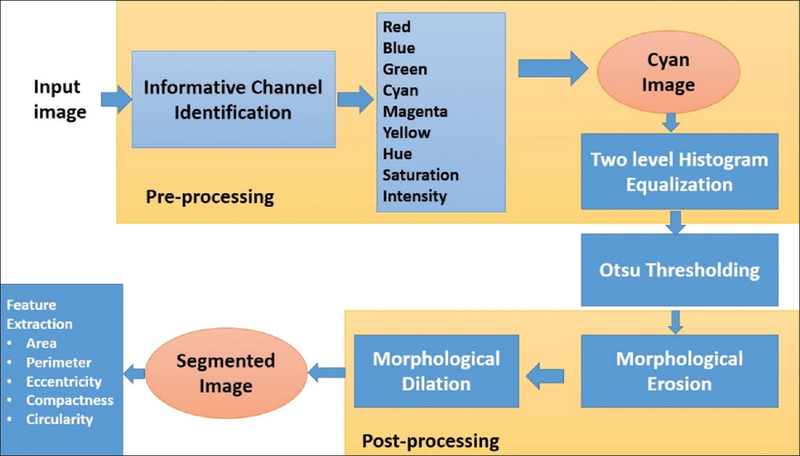 Results: Although well-preserved morphological features and cleaner background in TP allowed accurate diagnosis of malignancies, diagnostic yield was comparable to conventional preparations. Immunocytochemistry was successfully employed on TP smears which helped in accurate subtyping of the tumors. Few shortcomings of TP smears were uneven distribution of cells, thick cell clusters, and inadequate cellularity. Conclusion: Liquid-based TP preparation is an effective diagnostic tool for respiratory tract cytology, however, results are comparable to conventional smears. 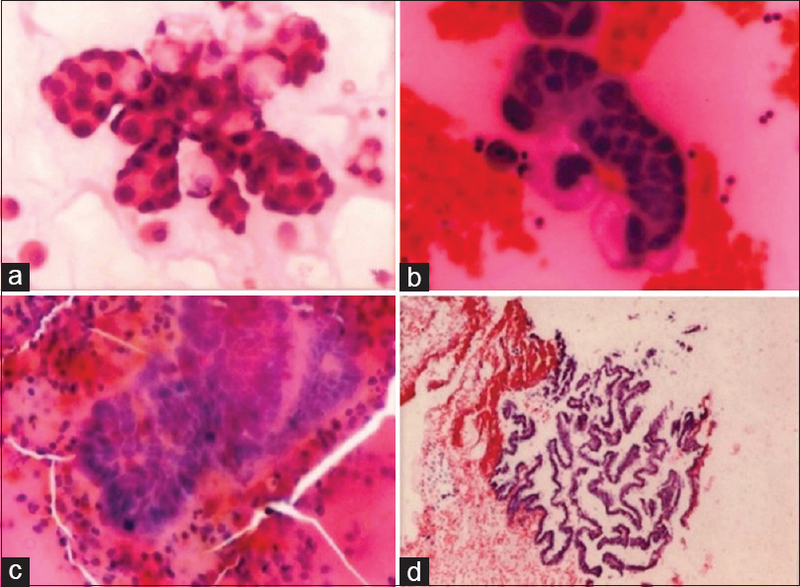 Context: Cytological changes in terms of shape and size of nuclei are some of the common morphometric features to study breast cancer, which can be observed by careful screening of fine needle aspiration cytology (FNAC) images. Aims: This study attempts to categorize a collection of FNAC microscopic images into benign and malignant classes based on family of probability distribution using some morphometric features of cell nuclei. 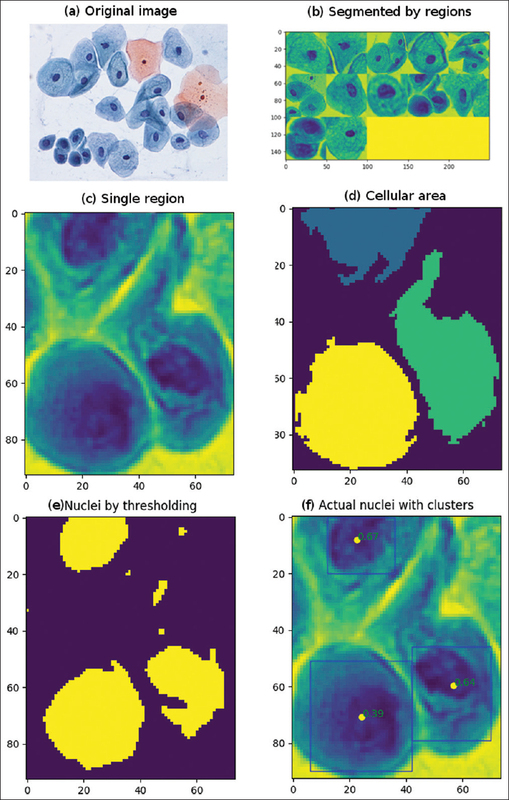 Materials and Methods: For this study, features namely area, perimeter, eccentricity, compactness, and circularity of cell nuclei were extracted from FNAC images of both benign and malignant samples using an image processing technique. All experiments were performed on a generated FNAC image database containing 564 malignant (cancerous) and 693 benign (noncancerous) cell level images. The five-set extracted features were reduced to three-set (area, perimeter, and circularity) based on the mean statistic. Finally, the data were fitted to the generalized Pearsonian system of frequency curve, so that the resulting distribution can be used as a statistical model. Pearsonian system is a family of distributions where kappa (Ò) is the selection criteria computed as functions of the first four central moments. Results and Conclusions: For the benign group, kappa (Ò) corresponding to area, perimeter, and circularity was −0.00004, 0.0000, and 0.04155 and for malignant group it was 1016942, 0.01464, and −0.3213, respectively. Thus, the family of distribution related to these features for the benign and malignant group were different, and therefore, characterization of their probability curve will also be different. Background: This study was planned to compare and evaluate the staining efficacy of Leishman–Giemsa cocktail (LG), Papanicolaou, and Giemsa stain (G) in potentially malignant disorders and malignant lesions. 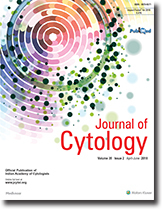 Aims: To evaluate the quality of nuclear and cytoplasmic staining of LG with G, and rapid Papanicolaou stain (Pap) and to compare the total staining efficiency of LG against G and P. Materials and Methods: One hundred and eighty participants were studied under three groups – 60 as healthy controls, 60 with potentially malignant disorders, and 60 with malignant lesions; smears were taken thrice from the buccal mucosa. One smear was fixed with Bio-Fix spray and other two smears were allowed to air dry for 2–3 minutes. Then, the ethyl alcohol-fixed smear was stained with Pap and the two other air-dried smears were stained with G and LG stains. Analysis was done using Friedman test and Wilcoxon Signed Rank Test with SPSS Version 15.0. Results: In the normal group, staining of LG was highly significant (P < 0.001). Among potentially malignant lesions, LG was observed to be highly significant (P < 0.001) when compared with G and was not significant when compared with Pap (P = 0.186). In the malignant group, LG was highly significant (P < 0.001). LG was superior with the highest average staining score of (2.018) than Pap and G. Conclusion: LG cocktail is a better stain with excellent cytoplasmic and nuclear staining intensity compared to Pap and G stains. Breast metastases are a relatively rare condition and account for approximately 0.5–2% of all breast tumors. Recognition of metastatic tumors in the breast is important because it would prevent unnecessary mutilating surgery and would lead to appropriate treatment of the primary tumor. Breast metastases from medullary thyroid cancer (MTC) are very rare with only 21 reported cases in the literature. Some MTCs mimic primary invasive lobular carcinoma of the breast histopathologically and radiologically, making the distinction between the two diagnostically challenging. We present the case of a 45-year-old female presenting with a lump breast, which was later found out to be metastasis from medullary carcinoma thyroid. Retinoblastoma is a rare malignant tumor of the retina usually seen in children before 5 years of age. The tumor is extremely rare in adults. We report here an unusual case of retinoblastoma in a 55-year-old adult female who presented to us with an orbital mass at a late stage of the disease. Detailed laboratory investigations and imaging studies could not make a precise diagnosis. The treating ophthalmologist suspected primary intraocular tumor, metastatic carcinoma, malignant melanoma, or lymphoma and referred the patient for fine needle aspiration cytology (FNAC). Cytopathological examination of Giemsa-stained FNAC smear was consistent with that of retinoblastoma and established the diagnosis.